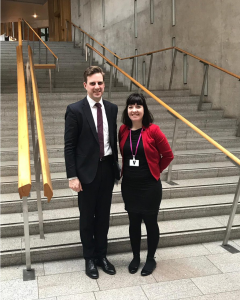 Last week, I travelled to Edinburgh to join our dedicated Public Affairs and Communications Officer for Scotland, Rachel Blair, for a couple of policy and public affairs meetings. First up on the agenda was a trip to the Scottish Parliament for a meeting with Edinburgh South MSP, Daniel Johnson. Regular readers of this newsletter will know that the Charity Retail Association is dedicated to improving safety for our shop workers and volunteers across the UK. I have previously reported on our efforts to promote this agenda in Wales and in England, and so was delighted to have the opportunity to meet Mr Johnson who is piloting a bill to protect shopworkers through the Scottish Parliament. The aim of his bill is to make abusing or attacking a shopworker – and, we insisted, also a charity shop volunteer – an aggravated offence carrying an additional punishment. The aim of this is to deter the kinds of unacceptable behaviour seen in retail environments across the UK. The bill would also include greater protections around age restricted goods, which in charity shops of course include DVDs and computer games. In addition to speaking about how the Charity Retail Association can support this bill, we also discussed the broader issues of the Scottish high street. The MSP has a particularly interesting perspective on this as a former retailer himself. He agreed to come to speak to one of our future Scottish members meetings about these broad issues. Next on the agenda was a chat with our colleagues at Zero Waste Scotland. We discussed their plans to promote confidence in the re-use sector with an accreditation scheme for anyone selling second hand goods. Charity shops could sign up this and gain additional support from Zero Waste Scotland including mystery shopping and online publicity. Keep your eyes glued to our blog for more information coming soon.